Use the form below to send a rental reservation, or call us at 253-272-4404. You must call us with a valid credit card to guarantee your reservation. Once a watercraft is reserved, we hold it specifically for you. We do have a 24-hour cancellation policy; you must call at least 24 hours ahead of time to modify or cancel your reservation. 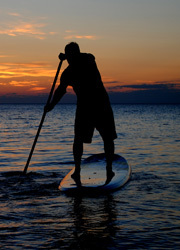 If you have reserved a kayak or SUP and do not show up or cancel at least 24 hours before your rental, your credit card will be charged the full rental amount. I agree to Foss Harbor Marina's reservation and 24-hour cancellation policy. I understand that my credit card may be charged if I do not show for my reservation or cancel at least 24 hours prior. Foss Harbor Marina is a full-service Marina located in Tacoma, Washington. We offer year-round covered and uncovered moorage, live-aboard slips, grocery & marine supply store, kayak and Stand up Paddle board (SUP) rentals. We also offer storage lockers and a fuel dock.